Malawi in good condition. Its now in my hands, and I am really happy for it. I just want to let you know that I got my ride and its cute. Everyone loves it. It's perfect and all was in place. Am forever in love with it. Yuki thank you I will be coming back for more. I HAVE SENT THE PHOTOS WITH THE RAUM IN KABWE TOWN, ZAMBIA. [...] MY FAMILY IS EXCITED AND HAPPY TO RECEIVE THE RAUM FROM YOUR COMPANY SPECIAL THANKS AND CONGRATS TO YOU COMPANY AND GOOD GRATITUDE YOU ESPECIALLY. MAY THE ALMIGHTY BE WITH U AND YOUR COMPANY. We have received our car in excellent condition. In the past we bought from other companies I can tell you compare to others the cars you are selling are much more better. Good quality cars. This is the third car we order from your company our customers are satisfied with their cars and looking forward to continue doing business with you. Maybe in the near future I would like to be your representative for this area. I would like to register my sincere gratitude and thanks for the unit I purchased in July from you, Honda Civic Ferio Stock code 116120. I received it on 18th September 2010 after clearing with the Kenyan tax authorities and to say the least, the car is awesome! I and my family really like it. What struck me about you is your professionalism and the way you took me through the whole process. My next purchase will be sooner than later and it will definitely be with Trust Co.
daughter and l were so happy, keep up the good work. Dear Turgeon, I hope you are well. I wish to inform you that I picked the car on Sunday and that the car is in good condition. I wish to thank you so much for your assistance. I am yet to familiarize myself with some functions in the car. I traveled to Dar es salam end of March to collect the car and made it 950km to Malawi. ever since ia have clocked another 3000km without any problem. just to inform you that i went to Tanzania and collected the vehicle on 26th August 2010. i wish i attached a picture but my internet is too slow to do that but thanks for everything it is in good shape and i am enjoying driving it. My car arrived a few weeks back and it was in a good condition. I received my Nadia and oh my God...! Its neat. I received the car TOYOTA PLATZ in a good condition. The picture is attached. i appreciate your company and highly recommend it to my friends. First of all, sorry for answer you so late, but I could manage to pick up the vehicle. Again thank you for your support and cooperation. I will contact you on my next purchase. fantastic.This is the best car for me. My car arrived last week Sunday, and I received it last week Monday. Wayne, I love the car. The interior looks brand new, and the exterior was in very good condition as well. Thank you so very much for all of your help. It was greatly appreciated. I am delighted with the excellent service that I received from your company & you. It made doing business with you a joy. May you have much success in all of your endeavors. I want to say I have received the vehicle, Nissan Bluebird Sylphy, I purchased from your company. I must say I am very happy with the condition of the vehicle. You sold me a very good car, I hope to enjoy driving it and cover a lot of mileage with it. I want to thank you and your team there at Trust Company Ltd, for the great job and service. You live up to your reputation as the seller of best vehicles. I will recommend to any of my friends who plan to purchase vehicles. 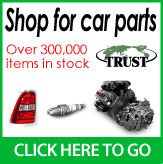 If I plan to purchase a vehicle again soon, I wont hesitate to contact Trust Company Ltd.
company. My wife is happy with the car and so am I.
accurate that I think Trust Company deserves the word TRUST in its name. It is with great pleasure to say that I got my VITZ yesterday evening after meeting all internal tax formalities. The car is in a very good condition and everybody from my family is happy and proud of your company. Once again thank you and may GOD bless you. Just to let you know that the car arrived and has since been received in good condition. Thank you so much for all your efforts in support for this transaction. We are very grateful. pleasure to thank you for fulfilling my dream of having Subaru Forester. agent, I'm really satisfied with your service.